Boeing 737-205 seen in Olsenbanden gir seg aldri! The Boeing 737 is a short to medium range, single aisle, narrow-body jet airliner. It was first introduced in 1968 and in January 2019 over 10,000 have been built, with production still ongoing. 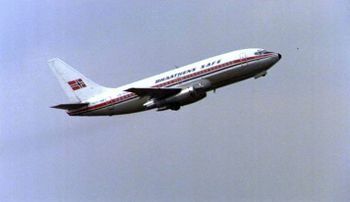 The aircraft has been operated by over 500 airlines and is the best selling jet airliner in history. This page lists all films that feature a variation of the Boeing 737. Pages in category "Boeing 737"